National Staffing Employee Week is Sept. 19-23 in the United States, and we want to show our appreciation for the men and women who make up the temporary and contract workforce, and especially those who work for Express every year. If you’re a temporary or contract worker, you’re not alone. In fact, according to the American Staffing Association (ASA), more than 3 million temporary and contract employees work for staffing companies each week in the United States. And during the course of a year, 16 million temporary and contract employees are put to work. Seventy-six percent of those employees work full time, and half say it’s a way to get a permanent job. Nine out of 10 employees say staffing work has made them more employable, and 35% have been offered a permanent job by a client they worked with on a temporary or contract assignment. Of those, 66% accepted the offers. Studies by ASA also reveal that nine out of 10 staffing employees say they are satisfied with their staffing company. Whether you’re employed by a staffing firm or are considering pursuing a new career path, use this week to celebrate the part you play in building a stronger economy and furthering your career. 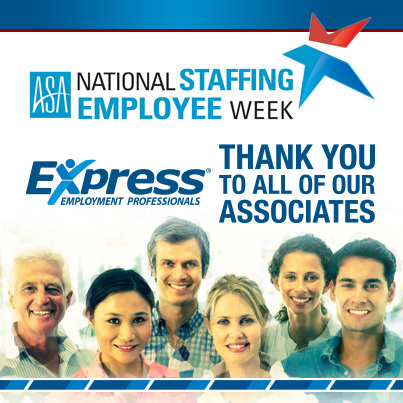 Express Employment Professionals salutes you, your hard work, and your dedication. U.S. National Staffing Employee Week: Thank You! Congratulations Employee of the Year Winners!